Fully automatic crate handling at the reception area is becoming ever more common in modern slaughterhouses. We put a main focus on a cost efficient and reliable system, providing maximum economic operation for the owner at really low investment costs. The system is designed to automate all important steps in the receiving area. Birds are collected from the poultry houses and placed in HD transport containers each of which have 12 shelves of transport crates. Following arrival at the plant, the containers are placed on the conveyor system and the crates are unloaded automatically. The crates are then conveyed towards the hanging area, whilst the containers are transferred to a washing machine for full cleaning and disinfection. 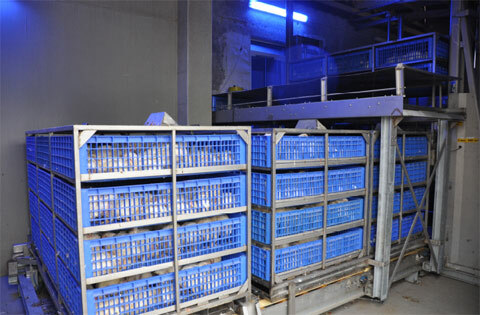 After the birds have been hung into the shackles the crates are also conveyed automatically, via a crate washer, towards the reloading station. There, the crates are pushed back into the containers and are ready to be re-used.